Hitting out at Pakistan, the Northern Army commander said that the neighbouring country carries out ceasefire violations and certain tactical activities along the LoC in a bid to support infiltration of terrorists from across the border. 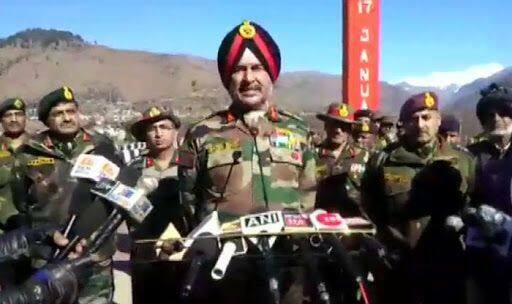 New Delhi: Northern Army commander Lieutenant General Ranbir Singh on Thursday revealed that at least 450 terrorists are active in Jammu and Kashmir with ‘full support from Pakistan’. Claiming that the terror infrastructure was intact in PoK and Pakistan, he stated that 16 terrorist camps were operating across the Line of Control (LoC). “They (terrorists) are being trained and then brought to the LoC. Then they infiltrate into Jammu and Kashmir. We are keeping these (activities) under surveillance,” he said. Lt Gen. Singh claimed that the Kashmir Valley has witnessed a relative decline in the number of people joining terror outfits over the last few months. However, he added that 191 youngsters are reported to have joined terrorism, stating that most of the recruitment took place up to the month of August. The Jammu and Kashmir police in January stated that last year, 12 of the 22 districts witnessed encounters between security forces and terrorists with Kupwara accounting for the highest number of terrorists (52) killed in such encounters.